The title is an interpretation of a dialogue from Carroll, L., Through the Looking- Glass, and What Alice Found There (London: Macmillan, 1871). On 18 December 2003, Iran actually signed the NPT (Nuclear Non-Proliferation Treaty) and allowed inspections to Iran's nuclear facilities by the International Atomic Energy Agency (IAEA). The treaty specifically gives Iran the right to use nuclear energy for peaceful purposes. On the other hand, Israel refuses to sign the NPT, and its nuclear facilities are closed to outside inspection. John Pilger mentions that since the end of World War II, the US has directly or indi- rectly overthrown 50 governments, plus attacked 30 countries. (Pilger, J., "Freedom Next Time", in Internationalist Review, no. 55 (September–October 2007), 33). 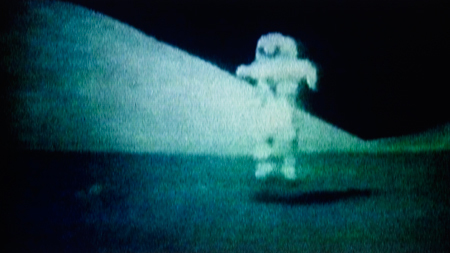 Curtis, A., The Power of Nightmares: The Rise of the Politics of Fear (180min/colour, 2004). Fukuyama, F., The End of History and the Last Man (New York: Free Press, 1992). Bohm, D., "A New Theory of the Relationship of Mind and Matter", in Philosophical Psychology, vol. 3 (1990), 271–86. Manguel, A., With Borges (London: Telegram Books, 2006), 63–72. Klein, N., The Shock Doctrine: The Rise of Disaster Capitalism (New York: Knopf, 2007). Žižek, S., Welcome to the Desert of the Real: Five Essays on September 11 and Related Dates (London: Verso, 2002). Elsaesser, T., "'Casting Around': Hitchcock's Absence", in Johan Grimonprez: Looking for Alfred ed. S. Bode (Ostfildern-Ruit: Hatje Cantz, 2005), 137–61. Wark, M., Virtual Geography: Living with Global Media Events (Bloomington/Indianapolis: Indiana University Press, 1994). Freud, S., The Uncanny, trans. D. McLintock (London: Penguin, 2003). Dolar, M., "'I Shall Be with You on Your Wedding-Night': Lacan and the Uncanny", in Rendering the Real, vol. 58 (Autumn 1991), 5–23. Catherine Bernard: We're are at the United Nations building in New York on the occasion of the Goodwill Ambassadors Celebration. While we're hiding out in a corner to start our dialogue, suddenly a huge flock of birds flutters up over the General Assembly! Johan Grimonprez: Yeah, funny, it's Hitchcock all over! Although, rather than The Birds (1963), the UN gives me more a taste of North by Northwest (1959), where the Cary Grant character is entangled in a case of mistaken identity chasing his very doppelganger, and then gets framed for murder committed right here on the premises of the UN. By the way, Hitchcock never had the permission to shoot here, so he had to make a double of the UN on a Hollywood set. And of course Hitchcock was keen on national monuments: they were his preferred spots where love stories and political intrigues ultimately met in a public stand-off. C.B. : It reminds me of what you do in your latest film Double Take (2009), how the political reality doubles the fictional narrative played out through the intimate dialogue between two Hitchcocks. The plot is unfolding at a time when history starts being staged on TV, when cinemas are closing down and the family gathers around the evening news. The media spectacle slowly begins to invade the home and eventually ends up standing for reality, or doubling it. J.G. : Exactly, one could even say that reality itself is caught up in a case of mistaken identity. In Double Take, the evidence of multiple doubles points to an ontological shift in the media industry. Just look at the reality of Weapons of Mass Destruction (WMD), which literally became a case of mistaken identity. The Bush regime was pointing the finger at the Middle East, while ironically the world's biggest stockpile of mass destruction was located in the US. And nobody dares say the emperor hasn't gotten any clothes on! Mainstream reporters simply endorse the charade as corporate advertisers for a war industry. It's actually right here at the UN that Colin Powell presented the blatant lies of the Iraqi WMD programme to the press in February 2003. He did this in front of a duplicate of Picasso's Guernica, which had been covered up for the speech, concealing the horrors of war! Wasn't that a bit of real life photoshopping, the Bush regime condemning precisely what was being perpetrated in Iraq? C.B: Such masquerade of reality is evident in the infamous speech given by Donald Rumsfeld (Bush's Secretary of State Defense at the time) about WMDs, which is placed as an epilogue to Double Take: "There are known knowns; these are things we know we know. We also know there are known unknowns; that is to say we know there are some things we do not know. But there are also unknown unknowns—that the ones we don't know we don't know." J.G. : Ha! WMDs as the present day MacGuffin! Slavoj Zizek pointed out that Rumsfeld left out the 4th hidden idiom: besides the known knowns; the known unknowns; and the unknown unknowns; there is also the "unknown known", namely the repressed side of politics flaunting its ideology. It's a mirror game that hides horrors in plain sight. According to Zizek, the reason why Rumsfeld lost his job is because he didn't know what he knew! C.B. : And wasn't it Rumsfeld himself who visited Iraq in the eighties under the Reagan administration to sell biological and chemical agents to Saddam Hussein? The unknown known! Indeed our reality today is embedded in a culture of fear that can be traced to the Cold War and has now become the modus operandi. It is part of the same ontological shift, the encroaching of society by a culture of fear, a game of mirrors and doubles. 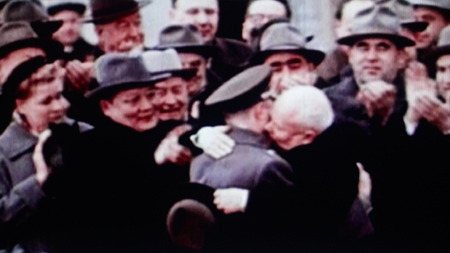 In fact, in Double Take, former Soviet Premier Nikita Khrushchev almost looks like a clone of Hitchcock. J.G. : Actually my favourite historical event to take place here at the UN was when Khrushchev, at the height of the Cold War in October 1960, pounded his shoe on the pulpit during a plenary session of the General Assembly. The CIA was involved in the Congo, setting Mobutu up against Patrice Lumumba who, after leaning towards the communist bloc, was assassinated a year later.4 I would have pounded my shoe just as Khrushchev did, even though he only got demonized in the American press for it. Not much different from today when reality of a divided world is constructed by inventing a bad guy, such as the fabrication of Al Qaeda, through storytelling and lies.5 The subtext in the 1960s was of course the Cold War's nuclear arms race, the Congo being crucial due to its rich resources of uranium. 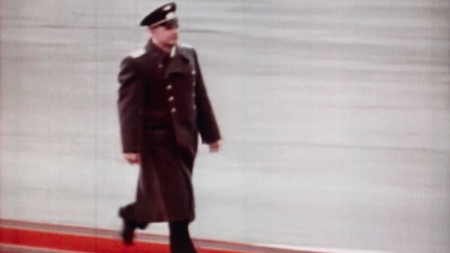 The whole world was being conditioned by a culture of fear, one played out through television sets staging two rival world powers mirroring one another. Even Kennedy came to power by exaggerating the Red threat. And television played a huge part in drilling fear into people during the Cold War, which seemed to justify a zero-sum accumulation of hugely expensive military nuclear stockpiles. This was not only the case at the beginning of the Cold War, but even more so at the end, when, with no reasonable gain in security, defence budgets escalated with the Star Wars programme while public programmes were eroded to a Third-World standard. History repeats itself. C.B. : Your film is framed between the rise and fall of the Berlin Wall, after which the narrative unfolds all the way up to Rumsfeld. Francis Fukuyama was quick to claim the end of history; the end of utopia with the collapse of the Soviet Union and a universalization of the western model of democracy.6 Almost immediately, however, history was being rewritten with the invasion of Iraq, creating a new outlet for the war and fear industries. Double Take shows how history repeats itself, and how the fear industry is forever pervasive today. J.G. : The Cold War established this global mirror game: JFK versus Mr K, Nixon versus Brezhnev, Reagan versus Gorbachev, and so on. Despite the fall of the Wall, a new configuration kept the world in a similar setting: a double generation of Bush versus the imaginary other of Saddam Hussein. Today Cold War anxieties are not only absorbed in politics but they are mirrored in the very fabric of life; it's a war on terror out there and it's a war on our immune system within our own bodies. However, it's a photoshopped version of reality. The swine flu pandemic orchestrated by the WHO was complicit with Big Pharma.7 We have said goodbye to history but at the same time said hello to a conspiracy reality. C.B. : The idea of a photoshopped reality brings up the question of how news media, and also films, TV soap operas, commercials, consumerism, etc.... construct our reality. The constant flux of images demands us to revise the very notion of a reality borne out of historical, social or economic contexts and blurs the boundaries between the phantasmic and the actual. J.G. : Reality is not a given. It's almost as if the world suffers from reality vertigo. The very notion of reality itself is at stake, or at least the access to reality that media is controlling. Reality has always been entangled with the stories we tell ourselves. Even the language we share, or not for that matter, right now while we're having this dialogue, is after all embedded in a worldview we agree on sharing. Reality is co-agreed upon, it's a "consensus reality" that is co-authored. Funny how Hitchcock used to say that reality is stranger than any fiction we could concoct. It reflects the new epistemology that is now emerging from within science confirming that reality is indeed much weirder than we initially thought. "You're theory is crazy," Niels Bohr once quipped to his fellow quantum physicist scholar Wolfgang Pauli during a lecture at Columbia University, before adding "although what divides us, is whether your theory is adequately crazy enough!" And really, quantum experiments describe the world as completely absurd—that the mind of the observer is entangled with the observed phenomena. We basically live in a participatory universe. Cognitive and life sciences assume that nature and mental phenomena emerge from matter (albeit not defining what matter really is) and do not acknowledge findings in quantum physics that have come to question matter altogether. Whereas consciousness used to be considered as something of a sidebar, as an after-effect of matter itself, a new epistemology redefines the emergence of reality as implicitly embedded within consciousness. Much in the way, quantum physicist turned philosopher David Bohm, defines consciousness as implicit to the basis of reality.8 So, we're back to storytelling! Science can only tackle this "reality" gap by including the storyteller, by including the observer. The old paradigm of a presumed objectivity as a privileged one-dimensional position meant only to relieve us from our core responsibilities, which only contributed to the bankruptcy of our world, obscuring ecological disasters, and adding to the military build-up and the global imbalance evident today. Just as the quantum paradox redefines reality as participatory, it's time we include our own responsibility as part of the reality we construct, as part of the stories we tell ourselves. Ultimately we're storytelling animals. Alberto Manguel once said about Jorge Luis Borges that "There are writers who attempt to put the world in a book. There are others, rarer, for whom the world is a book. "9 It's Borges' participatory universe of storytelling. For him, a book only exists when read. "It's the reader who gives life to the literary works because he rescues the words from the page." Similarly one could say: a film only exists when someone watches it. It's the viewer or reader who becomes the protagonist. C.B. : Let's go back to the idea of a constructed reality through politics, the culture of fear and the role played by the media. Nowadays the staging of reality has shifted from the TV screen to the big screen, which seems almost a sort of reversal of what happened in the sixties when TV pushed cinema over. Loads of films are prodigious commercial successes as they stage alien forces, cyborgs or extreme technology as the enemy. These also operate as doubles of the corporate or political entities that exert real power, and allow for its displacement into a series of spectacles outdoing each other in special effects and technological prowess. The created anxiety then justifies subsequent abuses of power. Look, for example, at the acceptance of surveillance systematically applied to our daily lives in an "age of terrorism", and whose necessity is fed though the news, movies or the web... Or for example the swine flu pandemic orchestrated through the media and powerful organizations such as the WHO, the UN and international governments as an attempt to generate control by disseminating fear. J.G. : Yup, today, Hollywood seems to be running ahead of reality. The world is so awash in images that we related to 9/11 through images we ourselves had already created prior to the event. In a sense, fiction came back to haunt us as a lookalike reality. As for our immune systems, they're being hijacked. Pharmaceutical corporations like Baxter merely buy market opportunities from governments who only legalize their greed: they want to own our immunity system! Buckminster Fuller once pointed out in an interview that corporations benefit from keeping humanity in a state of inherent failure and fear, and hence control. At the security control, before you board a plane, you're forced to take off your shoes. You're fumbled all over, your bag is searched into its most intimate details, you're not allowed to take your water, etc. Literally our bodies have become the very site of terror. It's symptomatic of a global system that turns permanent war and crisis into a modus operandi! It's what Naomi Klein calls the new phase of "disaster capitalism".10 It's the new contemporary sublime our world finds itself in today. We have been turned from happy innocent consumers into savvy consumers of fear. J.G. : Hitchcock used that a lot—in many cases he would libidinize the political plot. For example, the Cold War would be revisited through the love story, as in North by Northwest between Cary Grant and Eva Marie Saint. His love stories are often set against an international political backdrop that instigates the desires of the characters to keep the plot rolling. C.B. : This interpretation could also apply to The Birds where Melanie is the victim of the bird attacks and becomes progressively terrified, a situation that stands for a metaphor of the Cold War-induced paranoia. Birds take the metaphoric place of the missiles or war planes, and are revisited in Double Take as catastrophe culture descending into the home through the TV-set, trapping people as birds in a cage. J.G. : The anxiety in The Birds is usually interpreted by Hitchcock scholars in a Freudian sense: the birds mirror the tensions between the characters, as a metaphor for Melanie's repressed sexuality or the repressed anxiety of the mother coming back to haunt the village, but yes, maybe there's more going on... Today we could perfectly rethink the birds as an embodiment of the so-called ominous terrorist threat coming out of the sky (and propagated through the news media), very much in the way Slavoj Žižek compares them to the 9 /11 planes attacking the WTC.11 Political spin in fact is only one way of looking at it, but more than any other of Hitchcock's films, The Birds refutes interpretation and has generated every possible contradictory explanation by Hitchcock scholars. As Thomas Elsaesser points out, cinema studies about Hitchcock have proliferated to such a degree that they start to collapse under their own weight.12 He goes on to identify a Schopenhauer Hitchcock, a Heideggerian Hitchcock, a Derridean Hitchcock, a Lacanian Hitchcock, several Deleuzian Hitchcocks, a stab at a Nietzschean Hitchcock and even a Wittgensteinian Hitchcock. I could easily imagine them sitting around the dinner table, having a lively discussion. And in a sense this is the Double Take plot, where two Hitchcocks have a dialogue over a cup of coffee. Their conversation is partially inspired by the Truffaut–Hitchcock dialogues. Despite the fact that Hitchcock never meant to make an overtly political movie, seen in retrospect The Birds seems to perfectly reflect the zeitgeist and the anxiety of that period. At the same time as Truffaut was talking with Hitchcock in August 1962 on the set of The Birds, Khrushchev was sending missiles to Cuba. Two months later the Cuban Missile Crisis broke loose over TV, and the world was pushed to the brink of a nuclear confrontation, all played out as a media drama. C.B. : On another level this political backdrop also mirrors the repressed sexuality in the fifties, at a time when lots of women were at-home mums. 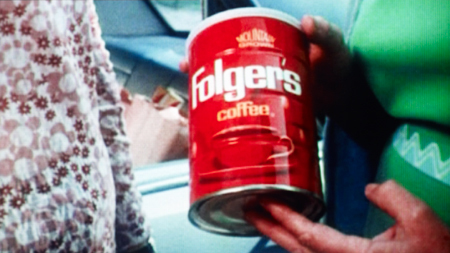 This comes through in the Folgers ads that literally function as commercial breaks throughout Double Take, in which the woman is seen trapped at home desperately trying to make good coffee for her husband. J.G. : As Heiner Müller once observed in relation to the impact West Berlin television commercials had on East Germany, commercials are the most political part of television.13 It's funny how in Double Take two guys do pretty much all the talking, but we could easily do the Hitchcock trick and libidinize the plot here! Not only the two Hitchcocks, but also the political figures of Khrushchev and Nixon who keep on talking about their rockets in the so-called "Kitchen Debate" while the repressed sexuality comes back to haunt kitchen dialogues between man and woman in the very first coffee ads broadcast on TV! C.B. : But then the woman exchanges roles and turns murderess by poisoning the coffee, thereby making this perfect symbol of domesticity a symbol of transgression and empowerment. In Double Take, the woman takes revenge, as she is the agent who brings the poisoned cup to Hitchcock. Did you want to point at the fact that his films are filled with women repressed by the culture of that time, and in a sense also by Hitchcock himself – the ordeal suffered by Tippi Hedren while filming the final scenes of The Birds is telling in that regard? Hitchcock is suspicious of female sexual power and can't let it overtake the story. In The Birds, Melanie falls victim to the birds, punished for what we learned early in the movie: for her carefree lifestyle and her ability to choose and pursue her partner herself. In the end, she isn't given any choice but to passively accept the birds as her fate. J.G. : Hence Hitchcock's confession in Double Take: "we always fell in love with our characters, that's why we killed them." All the characters in his movies are trapped in this situation, exposed to the Hitchcockian terror! He often portrays strong females leads. But isn't it precisely because they're agents of dangerous sexuality that they have to be castigated? Ingrid Bergman is a very independent character in Notorious (1946), so she's poisoned. Likewise with Janet Leigh in Psycho (1960): she's stabbed to death. Ditto with Tippi Hedren. As a free-spirited socialite from San Francisco she drops in at Bodega Bay, only to be attacked by the birds. Although fascinating and seductive, they're threatening! But maybe it points to a symptom of male hysteria, a man who is suffering from a split personality as the James Stewart character in Vertigo (1958), or caught in a case of mistaken identity as in the case of North by Northwest (1959). A man whose fear of intimacy or fear of death prevents him from really looking at the other, one who's trapped in his own narcissism. These characters only mirror Hitchcock's own fears and phobias projected back onto the female character as a way to try to contain her, or even poison her. 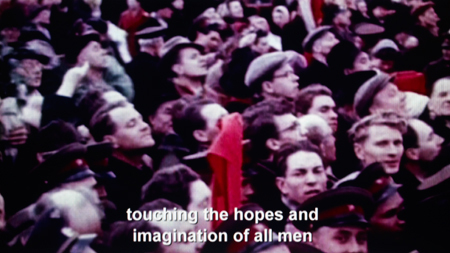 Similarly, this male hysteria is also displaced onto the woman in Double Take. Just as in Vertigo, it goes back to the schizophrenia within the man, the doubling that stems from the fact that the woman he tries to mould never really corresponds to his projection. He wants the woman to embody his own desire, but his dream woman never redeems his anxiety precisely because she refuses to fit into that mould. The man then is ultimately faced with a split reality. J.G. : Hence he has to kill his double! Hmm, maybe I need to get some therapy myself now that I've finished the film. But I believe so do some politicians! C.B. : Funny then that in your film it's actually the woman who poisons Hitchcock. The scene in Notorious where Ingrid Bergman drinks the poisoned cup of coffee is entirely reversed in Double Take. By shifting the aesthetic codes the commercial comes to stand for its exact opposite and turns the cup of coffee into a murder weapon—yet another example of juxtaposition of different layers in the film. J.G. : Well, Hitchcock's cup of coffee is never just a cup of coffee! The coffee ads in Double Take not only count for their documentary value, revealing the underlying ideology through their historical displacement, but they're also woven into the fiction plot: it's the commercial that literally becomes the murder weapon. They come to stand for the arrival of television. Indeed, one of the Hitchcocks in the film contends that television has killed cinema, alluding to how TV's commercial breaks have changed the way narratives were told. Hitchcock was very much part of that early television landscape, he who always faithfully introduced his own TV show Alfred Hitchcock Presents. 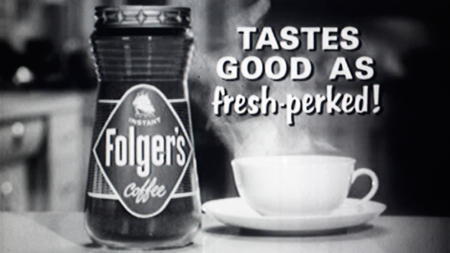 A minute of commercials typically followed this intro, but not before Hitchcock had berated the sponsor by voicing his contempt, jokingly and sardonically demanding how an ad could possibly dare interrupt his stories. It turned Hitchcock into the biggest television prankster of his time. The doubling of fiction and politics is also mirrored in Double Take through the rivalry between cinema and its televisual double. This in turn mirrors the plot that sets up Hitchcock the film-maker versus Hitchcock the television-maker. The encounter happens at a time when Hollywood had to redefine itself due to the closure of many cinemas caused by a loss of audiences to television. TV was on the rise, and it had to carve out a niche for itself within society. But alas, it's almost as if the social ritual of the coffee break gave way to the commercial break. First published as: Bernard, C. & Grimonprez, J., "It's a poor sort of memory that only works backwards: Johan Grimonprez en dialogue avec Catherine Bernard" in L'image-document, entre réalité et fiction, ed. J.-P. Criqui (Paris: Le Bal/Marseille: Images en Manoeuvres Éditions, 2010), 212–23.